We use to the full our abundant practical experience in the automotive sector in software development and validation/verification. 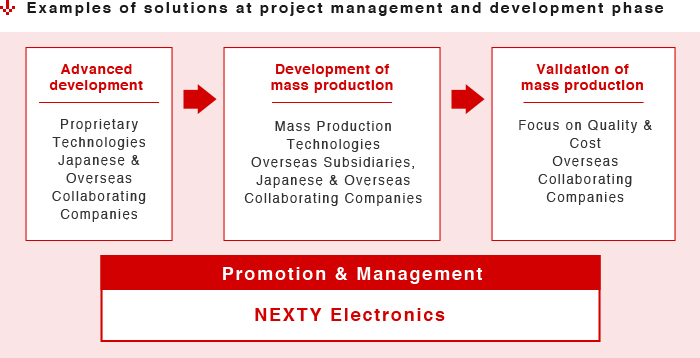 We have a working structure able to call on the resources not only of our own software engineers but also those our subsidiaries overseas, with unique and mass production technologies, and cooperating with over a hundred other companies inside and outside Japan. This business serves as our cornerstone, on top of which our software development team offers solutions, development and validation/verification services suited to our customers’ needs, while also engaging in the management of complex projects. We are actively scouting for companies possessing unique technology that will be under the spotlight in the next 5 to 10 years. We strengthen our relationships with companies that supplement our resources in development of mass production, and validation. Furthermore, we are constantly improving our project promotion and management systems. We capitalize on our rich experience in automotive sector to help our customers achieve their business goals with our high-quality and economical services, including proposal of development structure, development, validation, and project promotion management.